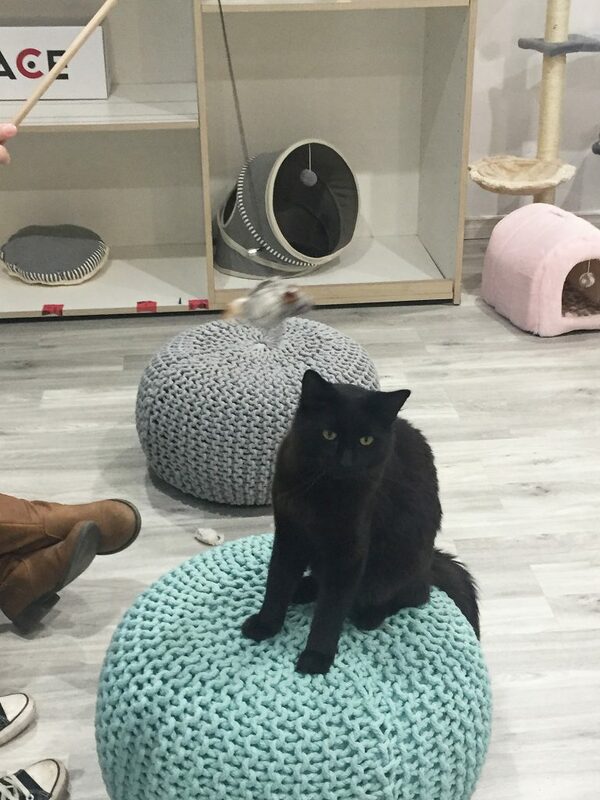 Alberta has its first cat cafe!! 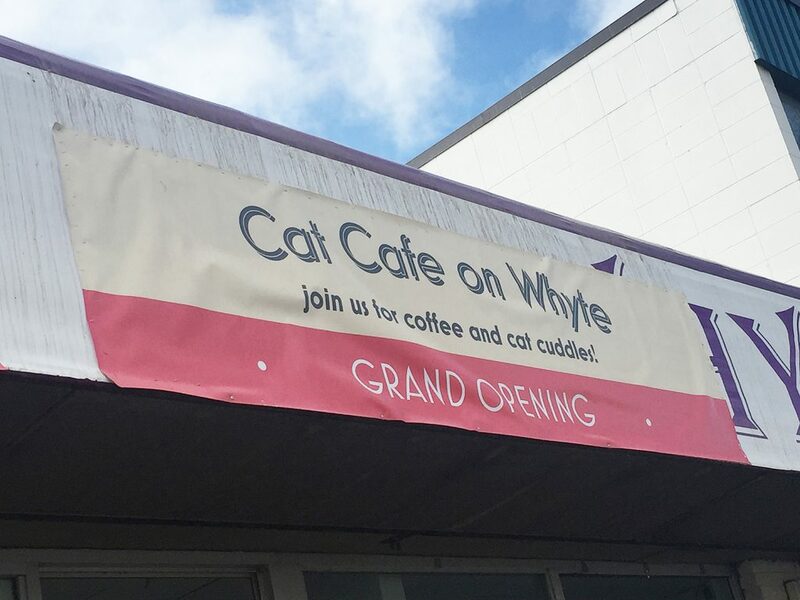 The Cat Cafe on Whyte (10111 – 82 Avenue) opened on March 30 – making it the first of its kind cafe to open in Edmonton and the province. 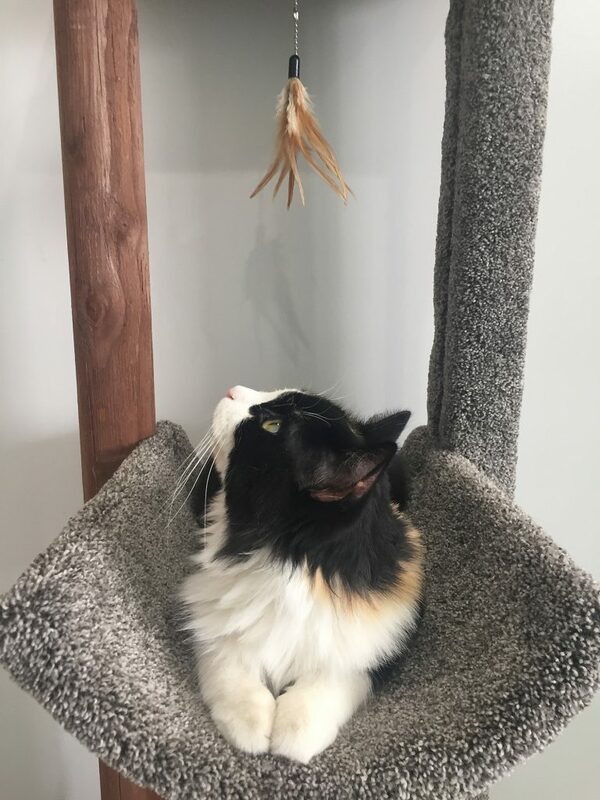 Alberta’s first cat cafe – the Cat Cafe on Whyte! So what is a cat cafe? 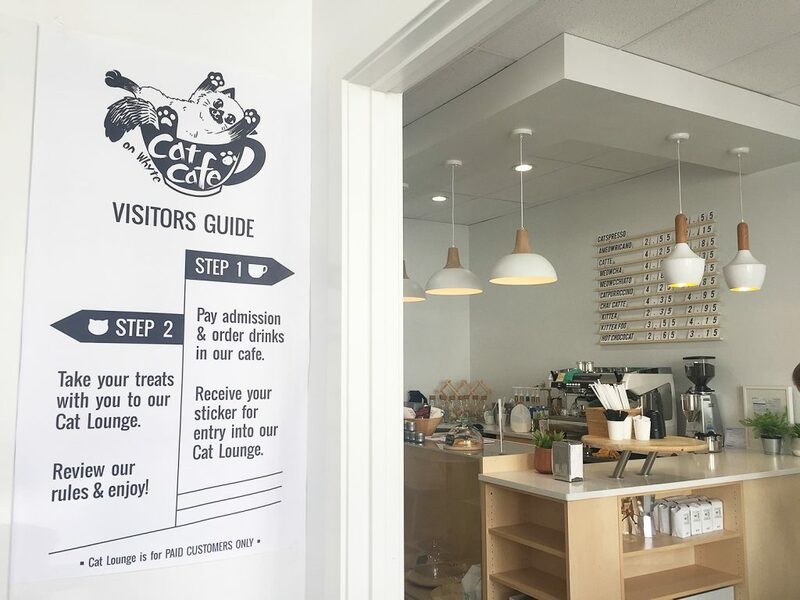 A cat cafe is your typical cafe serving up coffee and other related drinks, only the sitting/lounging area is filled with resident cats! Fun right? You’ll also find a much higher degree of cat toys, cat beds and cat decor in a cat cafe than you would other cafes. Cat cafes originated in Asia, where they’re still quite popular (along with other novelty animal cafes like owl cafes and bunny cafes). 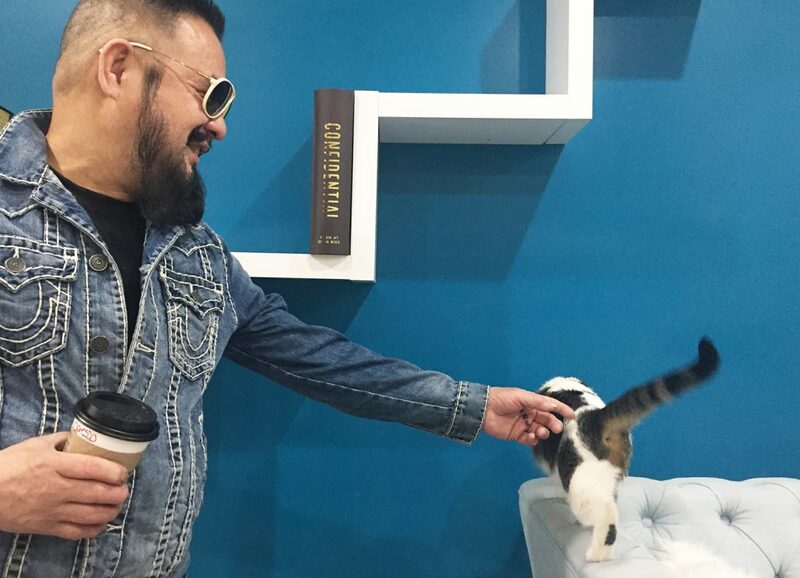 In recent years, cat cafes have been popping up all over North America. 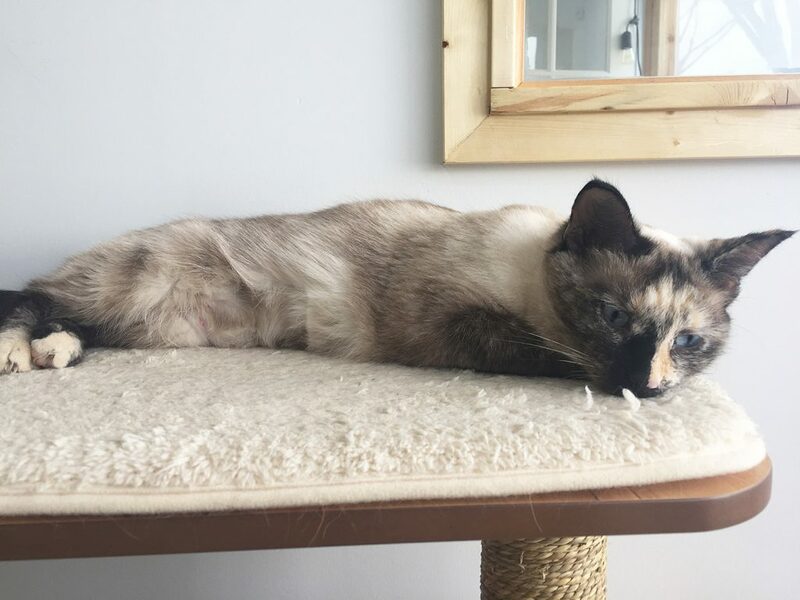 These adoptable, rescue cats are living the life at Cat Cafe on Whyte! I visited a bunch of cat cafes when I went to Japan a few years ago – you can read my review and look at cute cat photos here. I’ve also contemplated opening my own in Edmonton but obviously didn’t follow through with that idea (lol). I was thrilled though to learn about the Cat Cafe on Whyte and was excited to visit with my dad this week! (hehe, he is a closet cat fan because of his fur niece Thor). 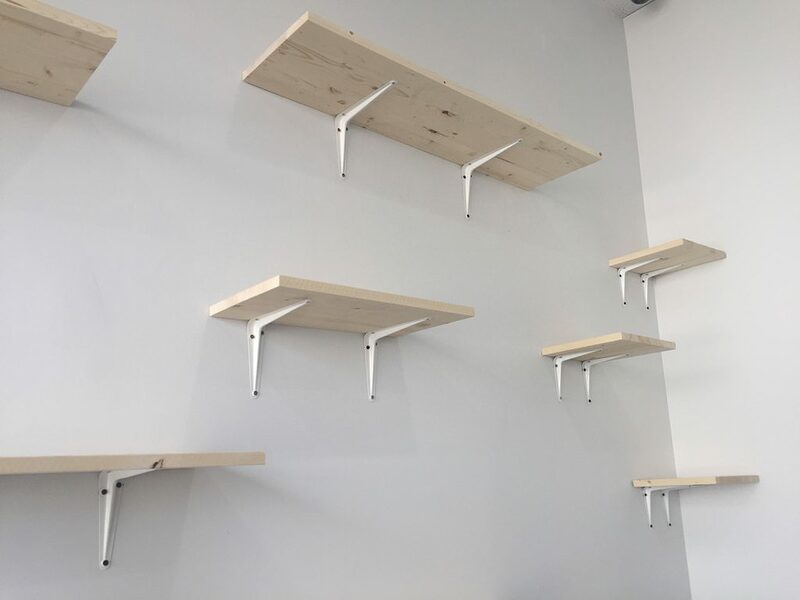 Inside the Cat Cafe on Whyte (10111 82 Avenue). The coffee preparation area is in a separate room than where the actual cats hang out (for health and food safety). 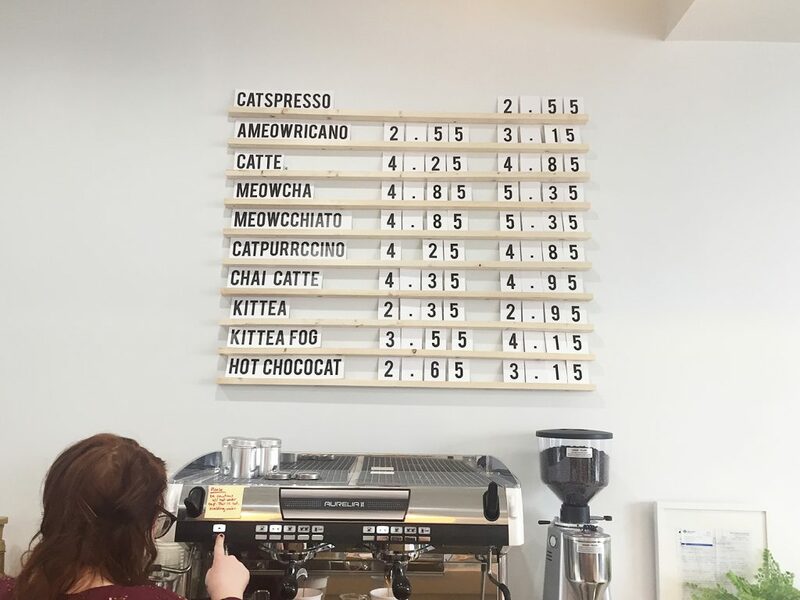 You can just order a drink – which have the CUTEST cat pun names like Ameowricano and Catpurrcino, but obviously if you’re at a cat cafe you want to be with the cats so there is an admission / visiting fee of $15 for one hour with the cats, which includes one drink (any size). The punniest cat drink names! Cat visiting fees are pretty standard for cat cafes in case you’re wondering, though $15 I think is maybe a bit pricy and might deter regulars. Their priciest drink is $5.35 so if you ended up getting that you’re looking at about $10 for the actual visitation time which isn’t too bad, but if you’re just getting a Kittea or Hot Chococat (lol) than you’re not getting quite as much value for your admission. You sign a waiver before you go in (I didn’t read it but it probably said if any cat scratches you, you can’t hold the cafe at fault lol). 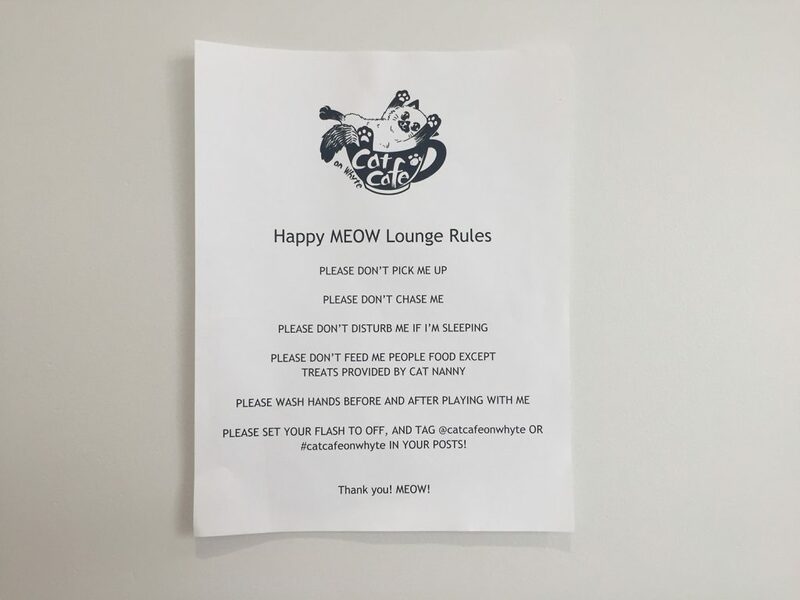 There’s also a list of rules (also standard for cat cafes) though I saw people not really following the don’t pick up a cat rule. Beautiful partnership with SAFE Team Rescue! 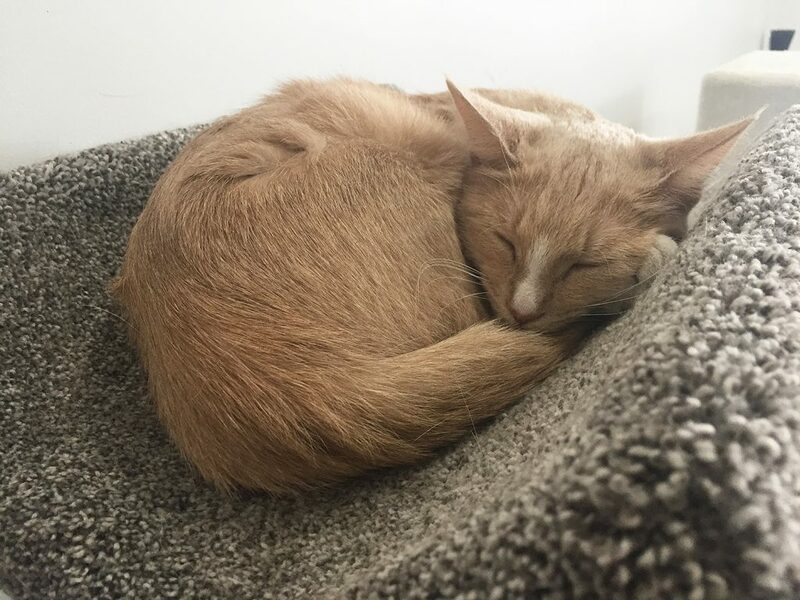 The best part about the Cat Cafe on Whyte is that they have a partnership with SAFE Team Rescue, a local cat rescue group – so all the cats in the cafe are adoptable! In fact when we were in there we met a couple who was visiting their adoption-pending cat! 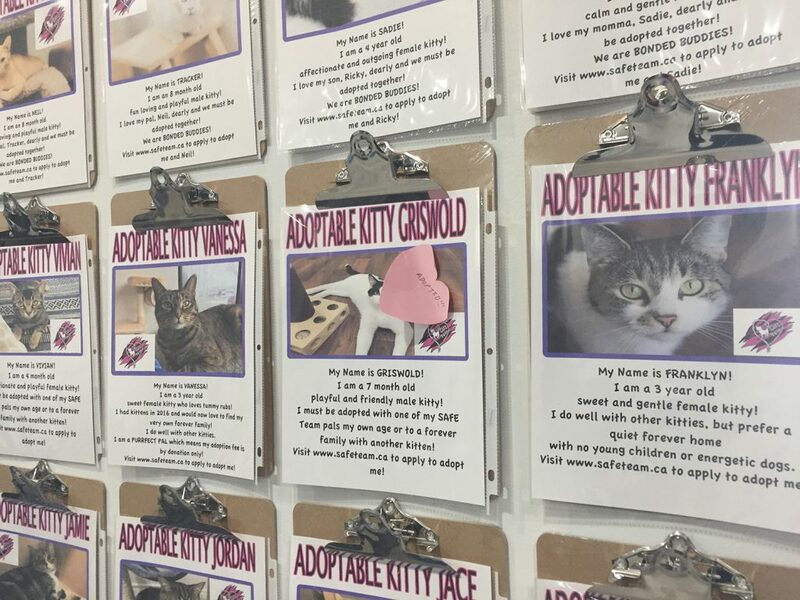 Pretty cool way to try and find more cats their furr-ever homes!! Also a nice way to encourage repeat visits – you’re likely going to meet and cuddle different cats throughout the year as more get rescued and more get adopted out. 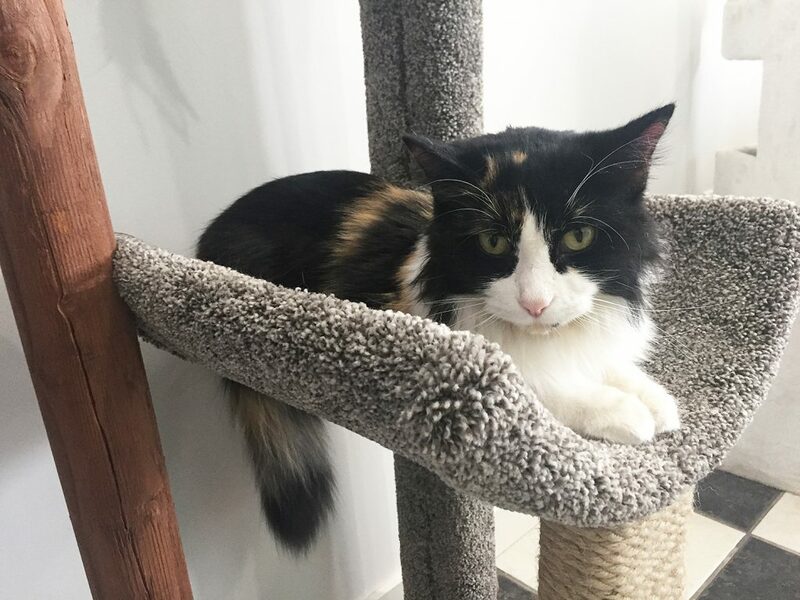 This cat was already pending adoption! 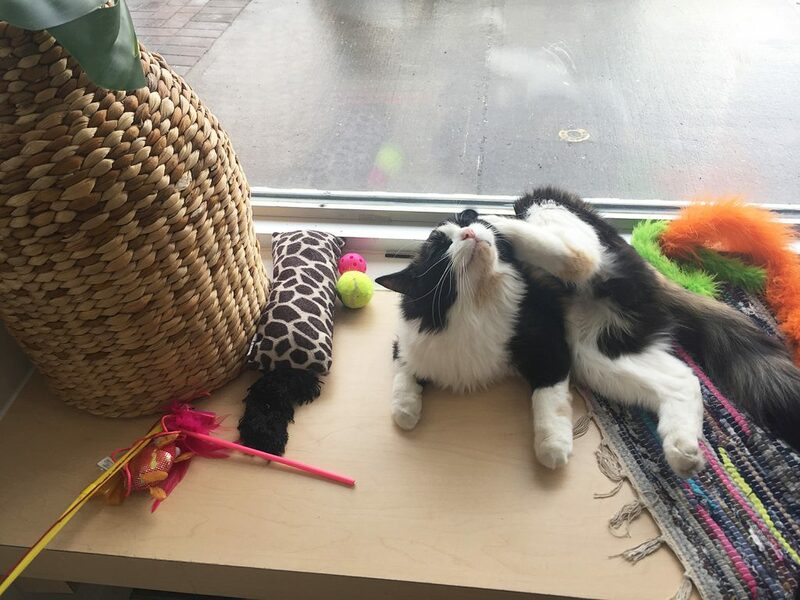 Cat Cafe on Whyte is open 7 days a week, accepting online bookings and walk-ins from 10 a.m. to 9 p.m. They do about 50% reservations and 50% walk-ins. When we visited there was quite a few visitors – about a dozen. And there were about 10 cats that I saw (could’ve been more in the hidden room where I’m sure the litter boxes are being hid lol). 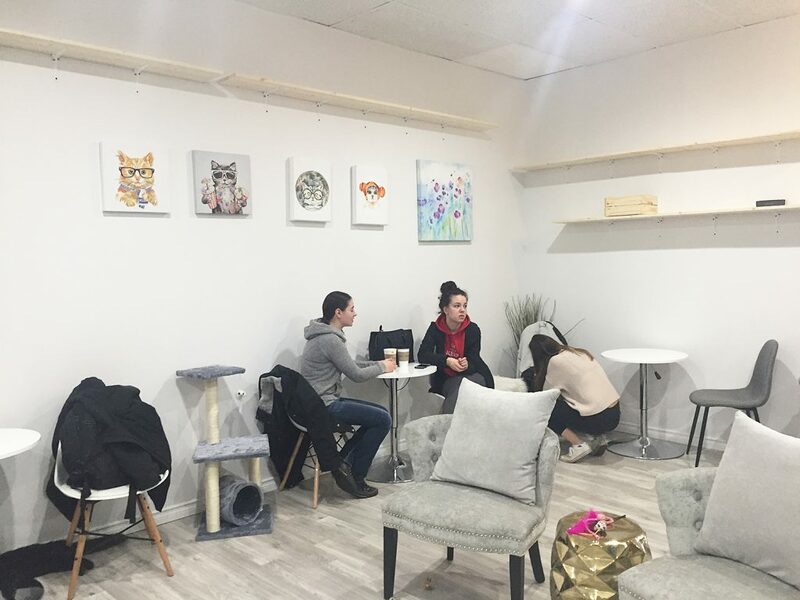 Apparently over the grand opening weekend, there were lineups out the door – people were so excited to get their cat cafe on! I didn’t notice any smell (you put 10+ cats in a big room you’re going to maybe have a cat smell) but I didn’t notice anything. This is where air purifiers/humidifiers and the like really come in handy though, lol. I’m really excited that this concept has finally arrived in Edmonton and Alberta. 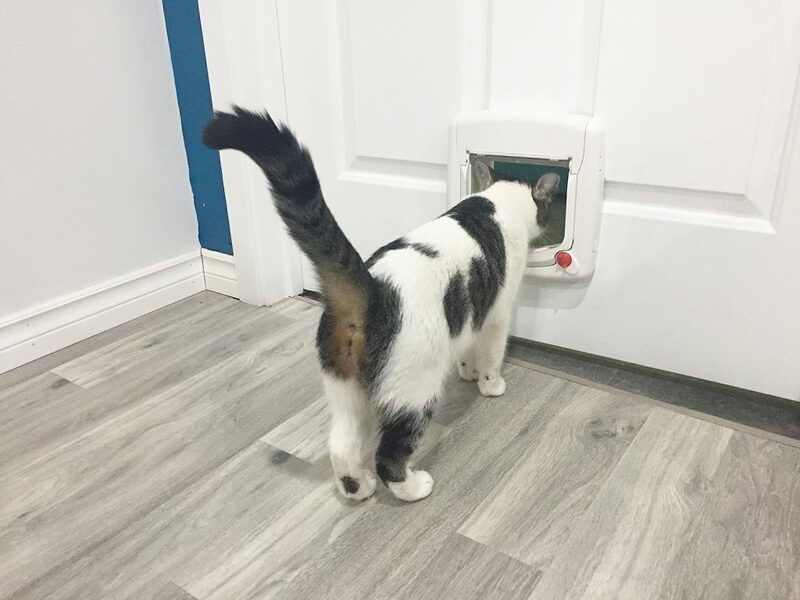 There’s a cat cafe set to open in Calgary shortly (Regal Cat Cafe) and I can only assume this cat cafe in Edmonton is just the first of a few (remember when escape rooms exploded in our city? lol). There was a Kickstarter campaign for a different cat cafe not long ago (though it didn’t achieve it’s fundraising goal and I’m not totally sure that status of it right now). We are a population of more than a million, so I’m sure multiple cat cafes can find success here! Overall, a lovely, bright, well-designed (good cat decor) space. Good coffee (from ACE Roasters). Good location (more cool spaces opening east of the Whyte Ave tracks!) Adorable cats and a great partnership helping a local cat rescue. 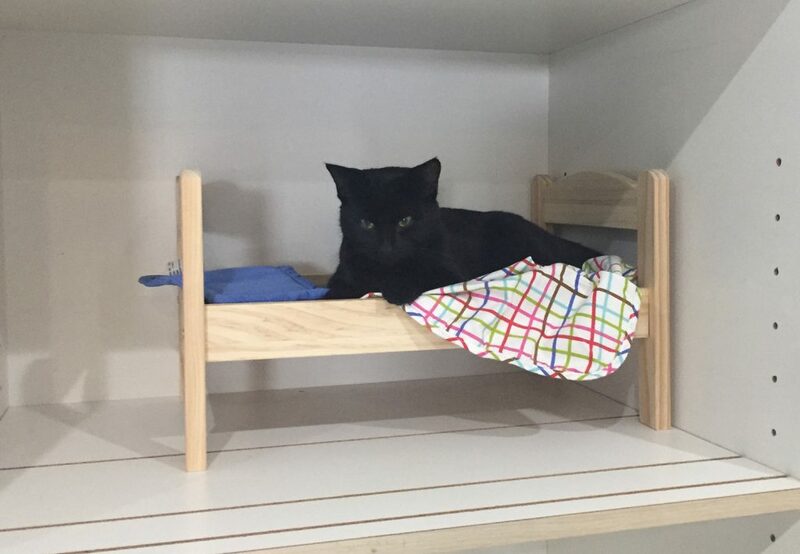 A cat’s paradise – cat towers, beds, toys everywhere. 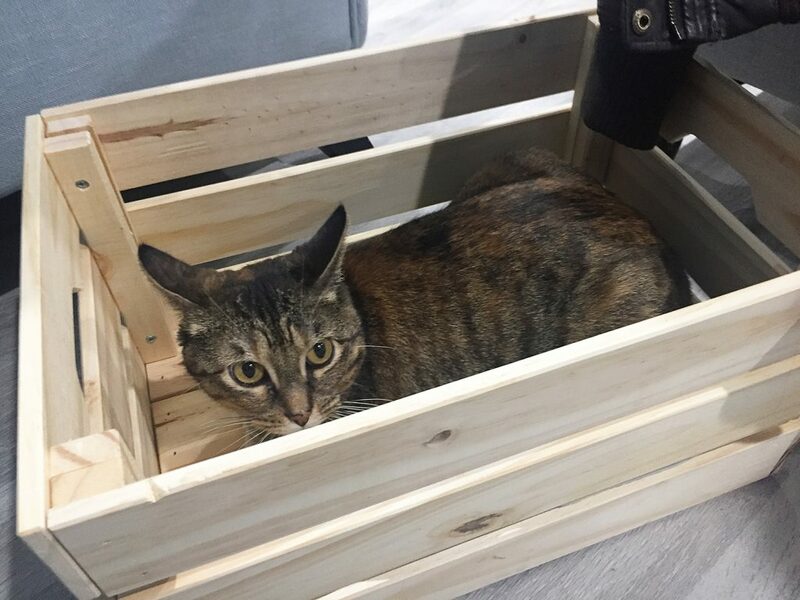 Box/crate heaven at the Cat Cafe. Mostly the cats just wanted to sleep, lol. I must find out where to buy these adorable cat beds! Dad loved the markings on this sassy cat! Many boxes for cat photo shoots. 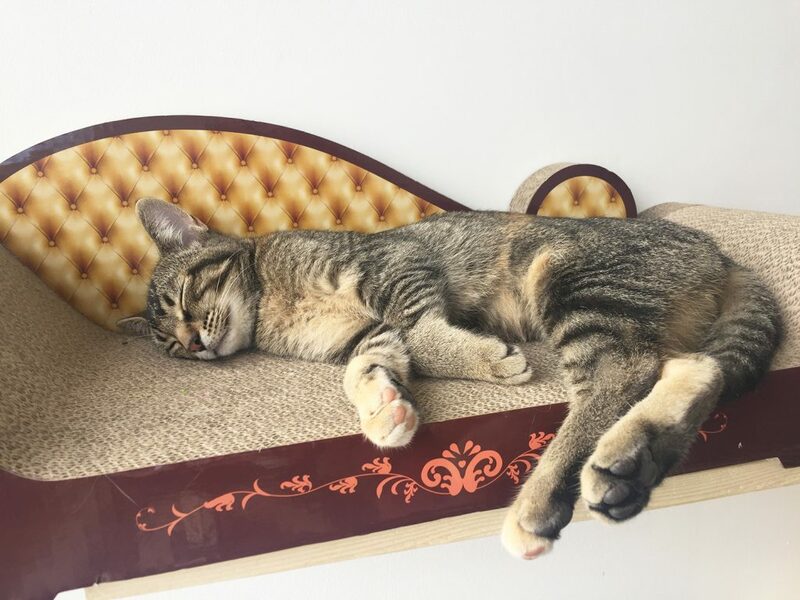 I think they would also benefit from helping people order their own cute, custom cat beds and crates and decor as seen in the cafe too. And I hope they add food options soon! 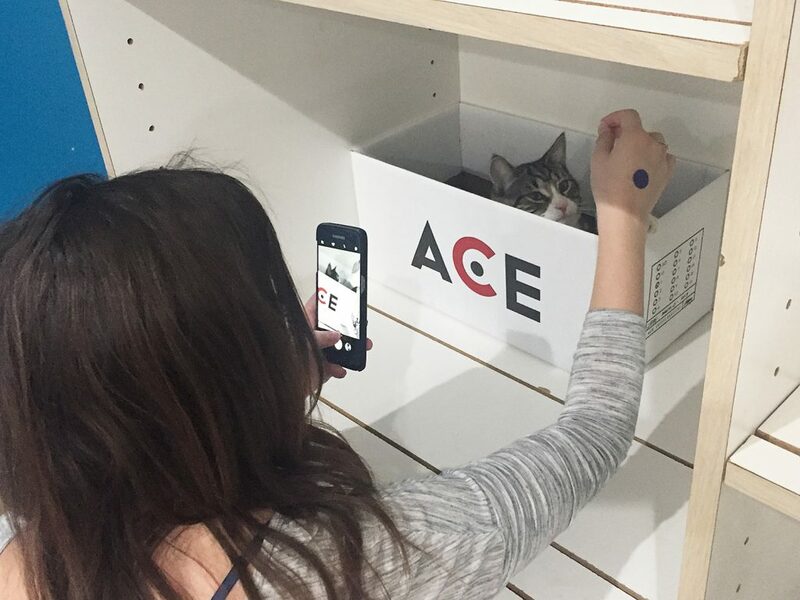 And let me know if you’ve been to this cat cafe – or others! The cat bed is actually a doll bed from ikea. My cats love theirs!! Thanks for the heads up Melanie! I must get one (two… three..) lol !